What does bubble tea or boba mean? Bubble tea, also known as boba, is a Taiwanese drink of tea infused with milk or fruit and served over tapioca balls, called bubbles or boba. honestly little things make me so happy , surprise me with a slurpee ice cream or boba and you'll make me a happy person. Bubble tea is usually said to have originated in Taiwan in the 1980s when a teahouse manager thought to put some tapioca balls—sweet, chewy globs usually made from the cassava—into some cold tea. In Taiwan, bubble tea is natively called pearl milk tea in Chinese, with the tapioca balls likened to pearls. In English, these balls are called bubbles, sometimes rendered as boba in Chinese and with boba sometimes used in the US for the entire beverage. The drink spread in Taiwan and Southeast Asia in the 1990s and made the jump to the US in the 2000s, first spreading in cities with Taiwanese populations like San Francisco and New York, thanks especially to entrepreneurs like Boba Guys. 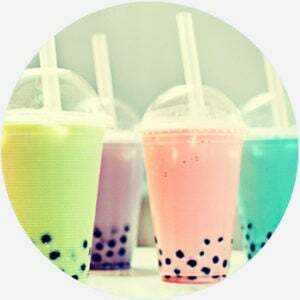 While bubble tea is traditionally made with black or white tapioca balls, other popular types include clear, flavored, popping, and mini boba. The tea can be served hot or, more commonly, iced and made from various teas, including, black, green, white, and herbal blends. Essential to the drink is its wide straw for slurping every last little boba. In 2012, a German study identified cancer-causing chemicals in tapioca balls, but subsequent research questioned the actual extent of the threat the chemicals posed. The balls themselves, though, are real choking hazards for children. The health scare didn’t stop comedy music duo the Fung Brothers, who released a song honoring bubble tea and its place in Asian-American life in 2013, Bobalife. Nor did it stop the brand Kung Fu Tea in 2018 from registering April 30th National Bubble Tea Day in the US. Young, often female Asian Americans don’t just find bubble tea or boba delicious, but also drink it together as an important social act. Pictures of #boba or #bubbletea are particularly Instagram-able. People have very strong feelings about bubble tea. Some find the texture of the tapioca balls disgusting. Many others, however, are obsessed with it—and boast the swag to prove it.